Our saints and sages, our holy men and holy women, were born in all parts of the country. They may speak different languages but they all place before us the ideal of realizing the eternal relation between the eternal soul and the eternal God. Their teachings form part of our entire spiritual heritage, our common spiritual knowledge. The more we recognize this the more our hearts will beat to the same spiritual tune and bring about a grand union, essential not only for the progress of India but for the whole world itself. Even from the most ancient times the worship of the Supreme Spirit in the aspects of Shiva and Vishnu has been prevalent both in the North and the South. The religious stream flowed from the North to the South and again from the South to the North. It is a remarkable phenomenon in the religious history of India that while Rama and Krishna - the two most popular incarnations of Vishnu -Êthe allpervading Supreme Spirit - were born in North India, they came to be worshipped in South India also. In the post-Buddhistic revival of Hinduism, South India had become the storehouse of Hindu culture and gave birth to the three great Acharyas Shankara, Ramanuja and Madhwa. All the three travelled to the North, preached their doctrines and greatly influenced the religious thought of North India. Sri Ramanuja is credited with having founded a Sri Vaishnava School at Varanasi during his visit there. 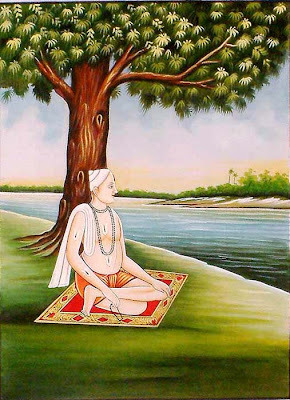 Fifth in apostolic succession to him, Ramananda became the inspirer of the Bhakti movement propagated by his disciples Kabir, Ravidas and others. According to one tradition, Ramananda had another disciple Naraharidas and it was he who raised the child who was later on to become the famous Tulsidas, and also initiated him into Rama-Mantra. then picked up by Naraharidas at the command of the Lord Himself. Later, Tulsi paid his heart's tribute to this Guru and foster-parent: I salute the lotus feet of my Guru, The ocean of compassion, and God (Hari) in the form of man (Nara), Whose words like rays of the sun Dispel the heavy darkness of over-powering delusion. He studied under another sadhu -ÊSesha Sanatana - for fifteen years, mastering the Vedas and the Vedanta. Tulsidas married Ratnavali who bore him a son. He was passionately fond of his wife. One day, on returning home, he found that she had left for her father's place. Pining for her, he followed her to his father-in-law's place, though uninvited. When he met her there, she was annoyed at his unbecoming attachment and said: "Great is your love for this body of mine composed of bones and flesh. Had you offered half of that love to Rama, you would have been spared from worldly troubles and have attained salvation." These sharp but wise words brought a new light to Tulsidas. It awakened him to the unreality of the world and worldly relations, and also to the reality of the Supreme Spirit manifest as Sri Rama. The result was that he renounced the world, and after having finished his pilgrimage to the four great holy places, Rameshwar, Dwaraka, Puri and Badarikashrama, he settled down at Varanasi. He undertook some more short pilgrimages now and then but would always return to Varanasi. According to one tradition, Tulsidas was born in 1497 and died in 1623, and thus lived for 126 years. Some modern scholars, however, hold that he was born in 1532 and passed away in 1623 at the ripe old age of 91. Now, at Varanasi his whole soul was drawn to Sri Rama and longed for a vision of Him. It is said that through the grace of the great Rama-Bhakta, Hanuman, he was blessed with several visions of the Beloved of his heart. Once the Lord appeared to Tulsidas on horseback as a prince. It is said that at the blessed vision he lost all consciousness of the outer world and remained in an ecstatic state for three days. At another time he saw the charming form of the prince, sporting on the banks of the river Sarayu, with his companion. At Brindaban Tulsidas visited many temples. Wherever he went, he saw only the image of Radhakrishna installed in the shrine. On visiting the famous temple of Madanmohan, he prayed to Sri Krishna: "Lord Krishna, You are very beautiful with Your flute and peacock plume but I would like to see You as Rama, the one with bow and arrow." 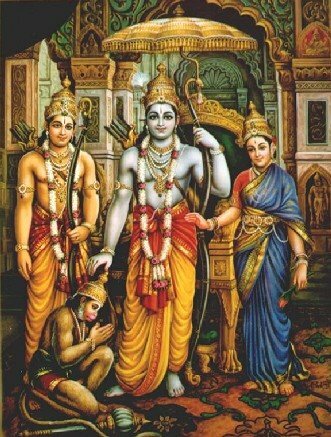 It is said that the prayer was granted and the Lord appeared to him in the blissful form of Sri Rama. The well-known utterance, attributed to Maruti, is true of Tulsidas also: "I look upon Vishnu and Rama as one and the same; but still I hold the lotus-eyed beautiful Rama as my All-in-all." At Brindaban again, learning that Tulsidas was a devotee of Sri Rama, a bigoted worshipper of Sri Krishna told him: "The Krishna Avatar is the greatest; Rama is only a partial incarnation". Hearing this, Tulsidas replied in his inimitable way: "My soul was full of love only for the son of Dasharatha, and I admired his incomparable beauty. Now that you tell me of his divinity, my love is increased twenty-fold!" The Lord made Tulsidas an instrument for the spread of Rama-Bhakti. In due course he realized that he who was born as the son of King Dasharatha was no other than the Supreme Spirit. His divine realizations filled him with love and sympathy for his fellow-beings and he was eager to share with all the blessings he himself received. We find evidence of this not only in certain incidents relating to his life but specially in his works, including his immortal Ramacharitamanas. The very circumstances leading to the composition of his second best work Vinaya Patrika reveal his great heart overflowing with divine love. Once a murderer came on pilgrimage to Varanasi and he would cry: "For the love of Rama, give alms to me, a murderer." Hearing the name of his beloved Rama, Tulsidas called the man to his house and gave him consecrated food, and declared him purified. The orthodox brahmins of the place asked him how the murderer's sin was absolved. Tulsidas replied: "Read your own scriptures and learn about the power of the Divine Name." The brahmins were not satisfied; they asked for a further proof. They all agreed that if the sacred bull of the Vishwanatha temple would eat from the hands of the murderer, they would accept Tulsidas's words. The man was taken to the temple and the bull did eat from his hands. Tulsi proved that the sincere repentance made by the devotee was accepted by the Lord. A new trouble, however, arose: Kali - the embodiment of evil - threatened to devour Tulsidas. Tulsi prayed to Hanuman who appeared to him in a dream and advised him to file a petition to Sri Rama - the Lord of the Universe - to remedy the evil, and that was the origin of the Vinaya-Patrika. Following in the footsteps of his predecessor Ramananda, Tulsidas also wrote his works in Hindi, for the benefit of the masses. This drew the criticism of the Sanskrit scholars. One day a pundit who was proud of his knowledge of Sanskrit, came up to him and asked: "Sir, you are learned in Sanskrit. Why then do you compose an epic poem in the vulgar tongue?" Tulsidas replied: "My language in the vernacular tongue is imperfect but it is better than the Nayika-varnana (the amorous descriptions of heroines) of you Sanskrit-loving pundits." The pundit asked for clarification; Tulsi replied: "If you find a jewelled vessel full of poison and an earthenware one full of ambrosia, which will you accept and which will you refuse?" In his introduction to his famous Ramayana, Tulsidas vindicates his choice of Hindi: "I am confident of one thing - that the good will be gratified to hear me though fools may laugh. If my homely speech and poor wit are fit subjects for laughter, let them laugh; it is no fault of mine. If they have no understanding of true devotion to the Lord, the tale will appear insipid, but to the true and pious worshippers of the Lord, the story of Raghuvir will be sweet as honey." Once some thieves broke into Tulsidas's place and found there a guard in the form of a young man of cloud-dark complexion, with bow and arrow in his hands. Wherever they moved, the watchman turned to them and threatened to punish them. They were terrified. Something more must have happened to the thieves: at daybreak they came to Tulsidas and asked: "Sir, who is this dark-complexioned lad of yours?" 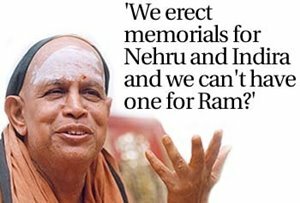 On hearing this, Tulsidas was deeply moved. He knew that the Lord Himself had appeared as the watchman; he gave away all he had to them. Now, the thieves themselves, having received the vision of Rama and the magnetic touch of Tulsidas, became spiritually inclined. They received instructions from the saint and lived a pure life, devoting themselves to God. Once, he took shelter in a certain home. As he was doing his cooking, the lady of the house offered him some spices to which he replied that he had those things in his bag. Then she offered him some other things which also, he said, were there. On hearing this, the lady replied: "Babaji, you have so many things in your bag. Only you have no place in it for your devoted wife!" Who was the lady? She was none other than the young wife whose words had changed the course of his life. She recognized him, although he could not and considered her a stranger. Various other incidents reveal how divine realization was the sole object of his life, and how he wished others also to strive for the same, with all their body, mind and soul. One Kamal Bhav requested him to procure for him a vision of Lord Rama. Tulsidas replied: "You do not meditate on the Lord with single-minded devotion; how is it then possible to have His vision? Continually worship Him with concentration. His grace will come of its own accord and you will see Him in a vision." Kamal Bhav insisted and so Tulsidas told him to erect a trident and jump over it repeating the divine name of Rama, and then Rama would come to save him. The man was afraid and would not take any risk. Another devotee, however, who had full faith in Tulsidas, did as he was instructed, and before the trident could touch his skin, it is said the Lord appeared and saved him. In Vinaya-patrika Tulsidas says in one of his prayers: Lord Rama! My honour is in Your hands. You are the protector of the poor; I surrender myself at Your Feet. I have heard of the sinners whom You have reclaimed. I am an old sinner, pray extend Your loving hand and take me to Yourself. To destroy the sins of the sinner, and to remove the ailments of the afflicted is Your occupation. Grant me devotion to You, O Lord, and confer Your grace on me! Tulsidas speaks of his awakening from the sleep of Maya, and expresses his determination to live the spiritual life: Up till now I have lost much and wasted life in idle pursuits. The grace of Lord Rama has aroused me from sleep. Awakened now, I shall not allow myself to be victimized by Maya (illusion). I have gained the grace of the Lord's Name. I shall hold it fast to my bosom and not let it from me for a second. The beautiful form of the Lord I shall cherish in my mind. Long has this world mocked me, making me a slave of the senses. Now I shall have no more of it. I am now a bee at my Lord's Lotus Feet and shall not allow my mind to leave the enjoyment of their nectar for a moment. In another remarkable prayer he expresses his great faith in the Divine Name: O Lord, let any one accept any sadhana, he is free to follow its pursuit. But to me Your name is the granter of all boons. Karma, upasana, jnana - the various paths outlined in the Vedas for the emancipation of the soul - all are good. But I seek only one shelter and that is Your name; I seek nothing besides.... I have enjoyed the sweetness of Your name. It is the fulfiller of my wishes here and in the world to come... A man may have his affection riveted anywhere as also his faith, But I recognize my relationship with the Name - Rama -; it is my father and mother. I swear by Shankara and state the truth without hiding it, That Tulsidas sees all good accruing to him only by repeating Your name. Tulsidas gives expression to pure devotion when he prays: O Lord who is there besides You who will hear my cry? Strange is my petition: a poor man, I, I seek to become a king... From time immemorial I have suffered the tortures of hell and have lived through many low births, but I crave not for wealth or even salvation though I know that You can confer all these. What I desire is to become in every birth a toy for You to play with or a stone to touch Your Feet. great truths hidden in Sanskrit available to the Hindi-knowing people - to the masses and the upper classes alike. Believed to be an incarnation of Valmiki, Tulsidas surpasses Valmiki at many places in the depth of his devotion and in his human touches. Ramacharitamanas begins with a dialogue between Shiva and Parvati. Parvati asks: O Lord, sages, who are the knowers of Truth, Say that Rama is Brahman without origin. Is he the same Rama, who is the son of Dasharatha, the king of Ayodhya, Or is he some other unborn, unqualified, and indivisible Being? If he is the king's son how can he be Brahman? Shiva replies: There is no difference between the qualified and the unqualified Brahman. ... He who is unqualified, formless and invisible Takes form through the love of his devotees. To Tulsidas the Supreme Spirit who took the form of Rama is manifest everywhere. In the Balakanda he says: Knowing all conscious and unconscious beings in the world to be full of Rama, With folded hands I salute the lotus feet of all. The Jiva under the control of Maya Tulsidas declares: The Jiva is a part of God and is indestructible; It is consciousness, pure, and blissful by nature. It has fallen under the control of Maya, And is tied down like a parrot or a monkey. The proud Jiva is under the control of Maya And Maya, the repository of all qualities, is controlled by God. And what is the nature of Maya? In the Aranyakanda Tulsidas declares its nature. Rama is speaking to Lakshmana: "The feeling of `I' and `mine' and `You' and `Yours' is Maya, which holds sway over all created beings. Whatever is perceived by the senses and that which lies within the reach of the mind, know it to be all Maya. "Hear of its divisions, also: they are two, knowledge and ignorance, Vidyamaya and Avidyamaya. The one (ignorance) is vile and extremely painful, and has cast the ego into the risk of worldly existence. The other (knowledge) which brings forth the creation and which holds sway over the three Gunas (Sattwa, Rajas and Tamas) is directed by the Lord and has no strength of its own." Posing the question as to how the Jiva can be freed from Maya, Tulsidas replies that it is through spiritual wisdom. And again, what is spiritual wisdom? Replies Tulsidas: "Spiritual wisdom is that which is free from all blemishes in the shape of pride, hypocrisy, violence and so on and which sees the Supreme Spirit equally in all." Which is the path that the Jiva (individual soul) should follow? Like a true devotee Tulsidas has his preference for Bhakti: The path of knowledge is like the sharp edge of a sword; One can fall from this path in the twinkling of an eye. But ignorance, the root of the round of birth and death, Is destroyed through Bhakti without much effort. The chief spiritual practice according to Tulsidas is Japa (repetition) of the Divine Name: "The Lord's name - Rama - fulfils all the desires and aspirations of the devotees in this Iron Age. It destroys the direst evil and turns poison into nectar." He says: "I salute the Name of Rama... which is like Brahma, Vishnu and Shiva, the soul of the Vedas and without parallel." Name and form are two attributes of God who cannot be described. The forms of God are dependent on His Name, for no form can be known without a name. But greater than Brahman with or without attributes is His Name because both can be known through constant remembrance of the Name. In a doha, a saying, the saint stresses this point: When meditation on the personal God is distasteful, And the impersonal is too far away from the mind, Remember the life-giving name of Rama. 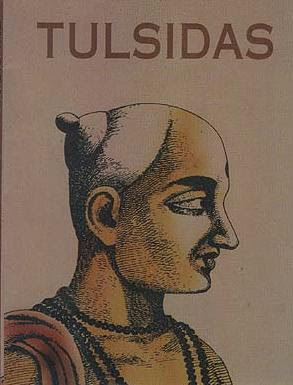 Tulsidas's poetry is unparalleled in its depth and originality. When Rama meets Valmiki in the forest and asks him to suggest a place where he can build a hut and live with Sita and Lakshmana for a while, among other things Valmiki says: Those who have neither desire nor anger, Nor pride nor conceit nor delusion, Those who are loved by all,... Those who look upon You as father, friend, master, Mother, and teacher, to whom You are all in all, Dwell in the temple of their hearts... Those who never wish for anything, Who love you quite naturally, Live in their hearts forever. There is your home. The Lord is pleased with the simple Bhakti of His devotee. Sri Rama, in the course of His wanderings comes to the cottage of Shabari. The maid had grown into an old woman waiting for him for years. Awaiting the arrival of Rama, she had preserved for Him fruits which she first tasted and found to be sweet. Sri Rama comes. Tulsidas describes the scene in a touching way: Sri Rama is asking Shabari for those fruits and eating them with great relish. Tulsidas observes here very aptly: "The Lord is the enjoyer of great sacrifices. Yet remaining unsatisfied with those grand offerings, He feels satisfied and happy with the fruits offered by the poor forest devotee." This aspect of Sri Rama reveals to the world that He dwells where there is love and becomes, as it were, a slave of this selfless love. The conversation that follows is also illuminating. The woman ascetic, Shabari, asked Sri Rama: "How can I extol you, the lowest in descent and the dullest in wit as I am?" Raghupati replied: "Listen, O good lady, to my words. I recognize no other kinship except that of devotion. Despite caste, kinship, lineage, piety, reputation, wealth, physical prowess, numerical strength of his family, accomplishment and ability, a man lacking in devotion is of no more worth than a cloud without water". Then He told her of the nine forms of devotion: (i) The first in order is fellowship with the saints (who are full of the spirit of God and remind one of God). (ii) The second is marked by fondness for stories about the Lord. (iii) The third is the humble service of the Lotus Feet of the spiritual preceptor. (iv) The fourth consists in singing the praises of God with a guileless heart. (v) The fifth is repeating the Name of the Lord with unwavering faith. (vi) The sixth consists of practice of self-control and virtues, desisting from manifold activities and ever pursuing the course of conduct prescribed for spiritual seekers. (vii) The seventh type is practised by him who sees the world full of the Almighty without distinction and reckons the holy men as even greater than the Lord Himself. (viii) The eighth type is to remain contented with whatever one gets and never think of detecting the faults of others. (ix) The ninth form of devotion demands that one should be guileless and straight in one's dealings with everybody and should cherish in one's heart implicit faith in the Lord without either exaltation or depression. Whoever possesses any one of these nine forms of devotion, says Sri Rama, be he man or woman, or any other creation - sentient or insentient -, is most dear to Him (Ayodhyakanda, 34-35). The final step in the path of Bhakti is the soul's self-surrender to the Supreme Spirit, the Soul of all souls. We ordinary people make the ego the centre of our life. The devotee, on the other hand, makes God the centre. He offers himself, body, mind and soul, to the Supreme Spirit. As the ego dies God reveals Himself and makes the devotee realize his eternal relation to Him. As a devotee he is the humble servant of the Lord; as a soul he is an eternal portion of the Supreme Being. This is exactly what had happened to Tulsidas also. He realized that He who was the son of Dasharatha was no other than the Self of all beings. May we be able to pray with Tulsidas: "O Lord, You are the inmost Self of all. I tell You the truth, I do not cherish any worldly desires in my heart. Do You free my mind from passions and other impurities. Do You grant me intense devotion unto You."